Michael Brown to Take Part in Upcoming Toronto Blessing NAR Conference. Home › Uncategorized › Michael Brown to Take Part in Upcoming Toronto Blessing NAR Conference. 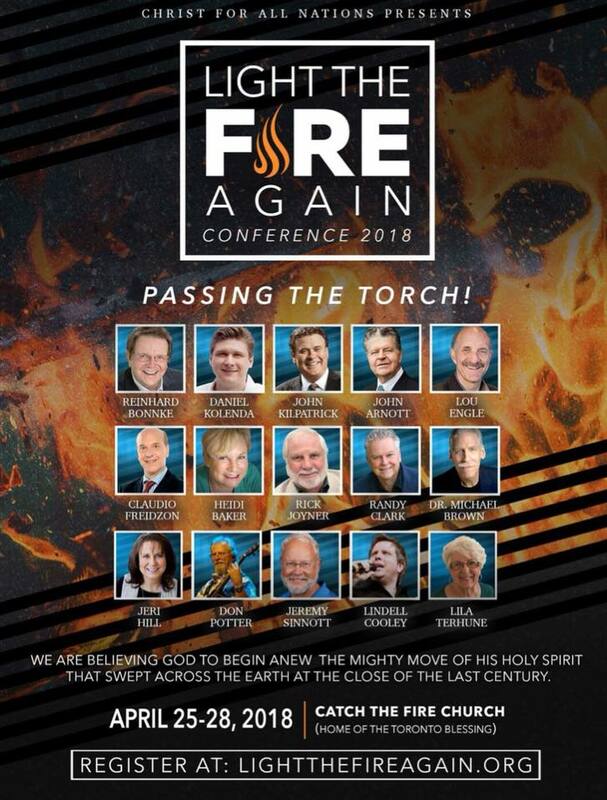 Michael Brown, the charismaniac apologist who is affirmed as an orthodox Christian believer – to be promoted to the church – by Dr. James White, is appearing at the “Light the Fire Again 2018” Conference. It is associated with the Toronto Blessing. In fact, it’s the first thing you see on the website. It advertises itself – as you can see above – as the “site of the Toronto Blessing.” The advertisement encourages people to come and be “a part of a historic gathering of leaders from the great global moves of God at the close of the last century,” referencing the Toronto Blessing and the development of the New Apostolic Reformation. The Toronto Blessing was a supposed revival of the Holy Spirit at the Toronto Airport Fellowship Church, which was known at the time as the Toronto Airport Vineyard Church. Randy Clark kicked off the revival, talking about how the presence of the Holy Spirit makes one act “drunk.” Soon, the congregation erupted in pandemonium with people laughing, growling, dancing, shaking, barking like dogs, and even being stuck in positions of paralysis. These experiences were attributed to the Holy Spirit entering people’s bodies. The pastor of the church, John Arnott, referred to it as a big Holy Spirit party (source link). Below is a video. The Toronto Blessing – which has widely been repudiated as demonic (at worst) or fake (at best) manifestations of the Holy Spirit even prompted the wildly charismatic Vineyard Church to sever ties with it (source link). This demonic outpouring was influential in the development of the Brownsville Revival in Texas (led, in part, by Michael Brown) and the Lakeland Revival in Florida (led by Todd Bentley). The 20th Anniversary Conference of the Toronto Blessing was held in 1994 and was called “Catch the Fire.” This year’s commemoration is “Light the Fire.” It is a continuance of the Toronto Blessing, hosted by the same people, at the same place, for the same sinister purposes. Below is the 2014 commemoration, with speaker, Benny Hinn. The Toronto Blessing is a movement that has blended with the New Apostolic Reformation that is so connected, they’re virtually the same thing. Here is Todd Friel explaining the NAR. Speakers at this year’s Toronto Blessing conference are mostly all NAR Apostles. These include Heidi Baker, Rick Joyner, Lou Engle and…Michael Brown (who says he’s not sure NAR exists; but to remind you, he also says he wasn’t familiar with Benny Hinn). By the way, those hyper-links above will take you posts about these individuals being NAR Apostles. 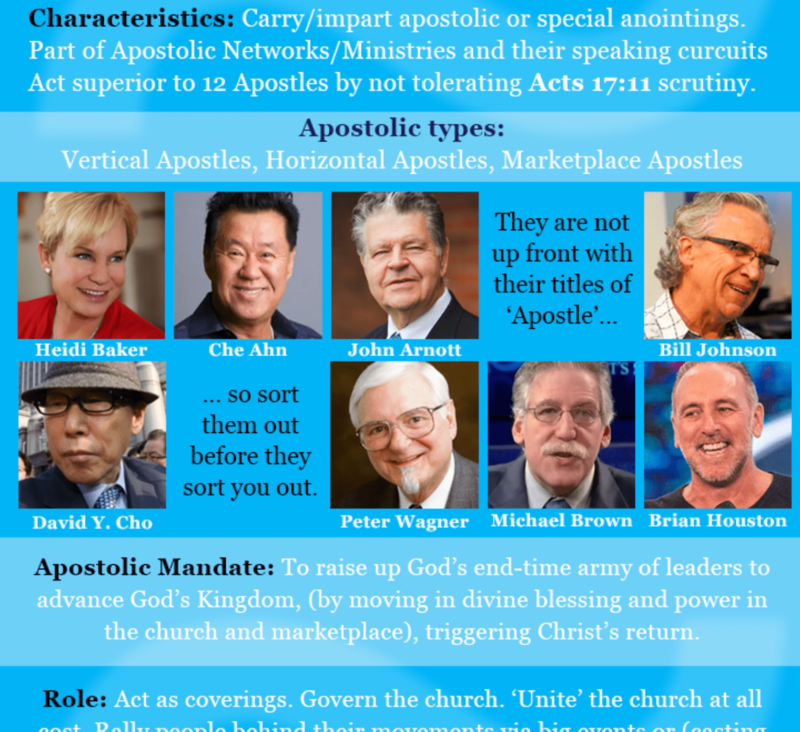 Notice the graphic about how to spot an Apostle below (HT ChurchWatch). Notice that the role of NAR Apostles is to united the church at all cost. Michael Brown is certainly succeeding, being able to get Reformed Apologist, James White, to support and promote him as a Christian brother. This gullibility cannot be excused or supported. This type of NAR unity can be seen in Lou Engle (who runs The Call, who is advertising the conference above) kissing the feet of a Vatican representative at an Azusa Street event or Kenneth Copeland skyping in the Pope to give a blessing at his event. Warn the brethren. Love the Church. Dispel the wolves. Care for the Sheep. ‹ What Michael Brown is hiding from his audience (Part 2): Damning 2010 audio proving Brown’s knowledge & involvement in the NAR.